You can place the sachet in either the bottle or just in your own wine glass. One sachet in a glass is good for four refills in the glass. Sachets are never removed from the glass or bottle. Studies have indicated that a daily glass of red wine may reduce your chances of developing such conditions as heart disease, high cholesterol and some forms of cancer. Recent studies from Italy have also suggested that this same glass of wine may help prevent conditions including Alzheimer’s and Parkinson’s Disease. per 5oz! Plus wine is a fat-free and cholesterol-free drink. Ago Red Wine was considered medicine in Ancient Egypt! of Americans are affected by Red Wine sensitivity. Gallons of red wine are drank in the US every year. With Wine SensitiveTM I can now share a fine wine with family and friends and not get the dreaded headaches. 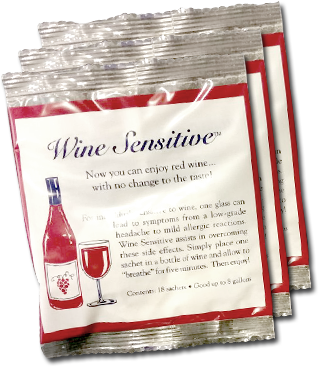 I never knew what I was missing until I started using Wine Sensitive. I now enjoy tasting the wide variety of wines.